Gary Radice runs THE MAGIC EYE website which celebrates the nostalgia and history of the Fun Fair. He got in touch to share a find with us - this quirky and charming pamphlet advertising the "International Gala" of the Shipley Glen Gable Tramway in May 1984. Gary's website is a fantastic find for us. It's packed full of historical detail, not least a brilliant interview with Mike Short who fell in love with Shipley Glen Tramway and the Pleasure Ground on Prod Lane, Baildon (where the tramway alights) as a small child. One of nine children, this was a cherished treat which drew Mike back to live in a house opposite the Pleasure Ground. The Aerial Glide at Shipley Glen, was reportedly the oldest surviving static amusement park ride in the UK and the only surviving ride of its type anywhere. When the site was proposed for housing development by its owner, Mike, his wife Di and their neighbours, Paul and Cathy Roberts, fought a valiant campaign to save the it and protect its heritage. Alas, the Pleasure Ground is no longer. It was dismantled in September 2005. Shipley Glen Tramway remains and long may this be so. Read Gary Radice's interview with Mike Short. It's informative and touching. There are some great images too. More information on Shipley Glen: the Urgent Submission for Spot Listing of the Aerial Glide and images of the demolition. I think it's a great little piece of UK leisure time history. If it's okay with you, may I put a link to this article on our site - probably in our history section? 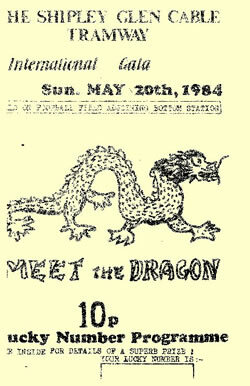 And thank you also for sharing the other link with us showing the leaflet of the May 84 Shipley Glen Gala. It's amazing how quaint publications like this seem in just a short time. Hi Gary, Like Pamela, I'm very grateful to you for reporting on the 1984 brochure, and more particularly for alerting us to your http://www.themagiceye.co.uk website. It's helpful to learn that there is an on-line presence devoted to leisure parks and their history; Shipley Glen was a huge attraction, not least in the early post-war years. Mike Short's article really strikes a chord for those of us who were introduced to Saltaire not because of its heritage but because in our childhood the way from Bradford to Shipley Glen involved a walk down Victoria Road. For me, Shipley Glen, the Glen Tramway, the pleasure grounds and Saltaire are very big parts of the whole story. It's very good that we now have this online link established, and Pamela's thought to provide a fuller link is welcomed. Many thanks to both Gary and Mike for enhancing my awareness and knowledge. Gary says: themagiceye is a non profit making and completely independent web site run on a budget of nil from a living room in merseyside uk. I get you completely, Gary! Pamela - spare bedroom - Saltaire! !